Hans: Give me that little black bottle. Q: What is a pinhead? Q: What is 'Freaks' about? Over the years, I've seen "Freaks" perhaps four times  all in theatres and on cinema screens in revivals. I've never seen it on TV, though I imagine it's been shown there. It's fascinating and hypnotically watchable still, not always for the right reasons. Yes, it's exploitive of the "freaks." Yet given their opportunities in 1932, when they were either confined in institutions or exhibited in sideshows all over the world, the film gives them a curious dignity simply by offering them a one-time appearance in a Hollywood film that demanded more of them (some of them) than mere sideshow antics. The script, of course, also gives them "dignity" of a kind, at least relative to the prejudices of the times (i.e., "Don't betray the freaks or they'll turn on you, cut you up, and make you one of them."). That the film was shocking in its day, and often banned, says far more about audiences of the '30s than the actual film. The only truly powerful sequence is the brilliant "storm" sequence that climaxes "Freaks." Emotionally, it is perfectly positioned in the film's structure: audiences inwardly understand and root for the "freaks" creeping and slithering through the mud beneath the wagon wheels to exact their revenge . . . while simultaneously being frightened of them and of what's to come. A brilliant and inspired sequence that deserves its legendary status. The remainder of "Freaks," though entirely watchable, is not always watchable for the right reasons, as mentioned. Namely the dialogue and the acting. The structure is fine. But many of the lines are stilted and phony, even for films of that era. None of the "freaks" were trained actors. Such careers simply didn't exist in those days. Midget Daisy Earles (as Frieda) does perhaps the best job. Yet even she has no notion (nor experience) of how to sustain a character arc. Her brother, Harry Earles (as Hans), has tremendous vitality in his role, but no idea how to deliver these lines convincingly. Yet he's a good instinctive actor, as witness his silent moments in the film. Olga Baclanova as Cleopatra certainly holds the screen, and is the "best" actor in the cast. Hers must have been a difficult task  playing a completely despicable circus diva with no redeeming value whatsoever. Henry Victor as Hercules? Mediocre. Tod Browning's VISION for this film was / is breathtaking. "Contrast real physical mutants with 'normal' people, and get the audience to identify with the 'freaks.' Then take them through a murderous, mutilating, emotionally wrenching climax." That's a challenge in 2005, much less 73 years ago. Browning's decision to use real "freaks" as opposed to made-up actors is noble and brave and true. But so intense were the prejudices of the day that that single decision affected every decision that followed. No "name" actor would agree to appear in the cast, citing "disgust" and worse. Five writers are credited on IMDb with the script  always a bad sign. None of the "freaks" had any real acting training or careers as actors. Much of the cast were amateurs, in other words, and it shows. Whatever tensions are generated by the story's structure dissipate whenever the lead midgets are on screen. Though Daisy Earles has some intermittent moments of effectiveness, Harry Earles does not. He almost sounds as if he's delivering his lines phonetically. 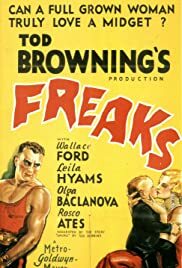 Absent good actors in the lead roles (Baclanova overacts continually, but it works in context with her character), I've often wondered what "Freaks" might have been as a silent film. The two great set-pieces (the wedding sequence and the "storm" climax) are amazing  for entirely different reasons. At the wedding, the "freaks" are obviously having a grand time "acting" for Hollywood's cameras, while Baclanova (convincingly) goes over the top. The sequence is disturbing on more than one level. First, it's impossible to believe that silly "One of us!" chant. Yet it's disturbing at the same time it's phony. Possibly it was accepted as "real" in 1932, but I doubt it. Second, you have an actress who was reportedly sweet and kind to her co-stars, having to behave abominably with them on camera. How did Browning explain all this to some of his mentally child-like "freaks?" Visually, the wedding sequence is nothing out of the ordinary. Emotionally, it is wrenching  both within the story structure and outside the fiction: this and several other scenes that are blatantly exploitive beg the question, "How were these people treated? Did they understand what was going on?" From all reports, the "freaks" were treated with respect and appreciation. The "storm" climax, on the other hand, is simply stunning cinema. Silent, except for the deafening thunderstorm, it is brilliantly lit, shot and edited. It is also emotionally jolting. Here, finally, the "freaks" we have identified and empathized with are reduced to monstrous "things" snaking through mud puddles in the dark of night. They're on their way to do God-Knows-What to the "normals." But by now, the audience has realized that the "normals" are really the "freaks," and vice versa. That's an amazing level of dual-audience identification and sophistication for 1932  or even today. "Freaks" is a failed enterprise in many ways. But Tod Browning's VISION of it was so audacious that it continues to stir controversy even now. The ending seems abrupt. Yet what other image could so immediately, efficiently, crystallize the themes of all that's gone before?